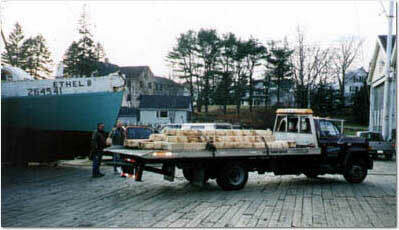 Delivering Timber to the Shipyard: The great majority of timber required is white oak, delivered as slabs. Wood has come from most New England States, New York, Illinois, and Virginia. It is delivered by truck and stored in a large shed for sorting and drying. Old long leaf yellow pine for the interior ceiling and clamp timbers was acquired from companies that are dismantling old barns and other large structures. 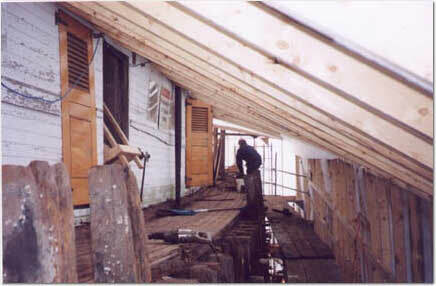 Main Deck View: Looking beneath the roof of the covering, the main deck and deckhouse side can be seen. A few remaining stanchion remnants remain at lower left and near the figure at center and have been left to guide the shaping of the new stancions. Tops of the top timbers can be seen. 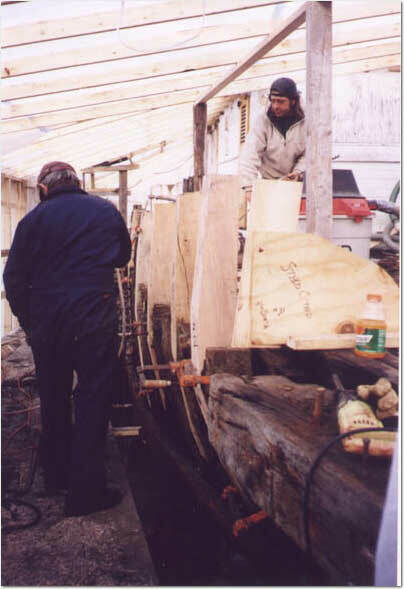 Reefing Seams and Butts: A shipwright is reefing a seam between lower planks. 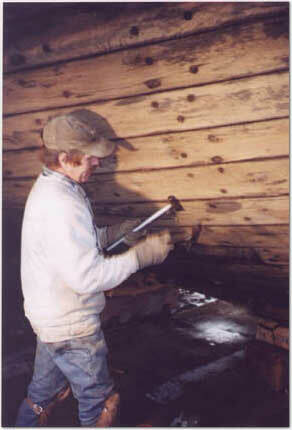 He is using a reefing tool in his left hand and striking it with the hammer in his right hand. This action drives a steel tooth into the seam and positions the lever to rip out the old cotton and oakum in the seam. Seams were also cleared with a special blade in circular saws. 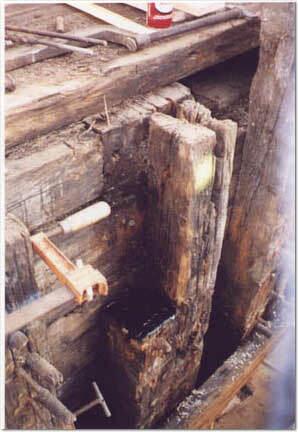 Top Timber Ready for a New Stancion: A freshly tarred futtock can be seen ready to have a new stanchion placed upon it. To its right (and aft) is the top timber for that frame. The top of the timber is badly split from rot and the swelling of iron bolts and spikes. This top timber will be cut down to a level with sound wood once the stanchion is secured. The planking at the bottom can be seen. Stanchions Up! A view of the aft port quarter shows the progression of stanchions placed atop the futtocks. The soon-to-be cut away old top timbers can be seen aside each. The template can be seen, moved from its position on the starboard side.